John Hathway’s father was a big fan of the Diablo-style action RPG Grim Dawn. He liked it so much that during an emergency room visit, he left the game running. In November, Lee Hathway died of lung cancer. Upon hearing the news, the developers of Grim Dawn decided to put Lee into the game. 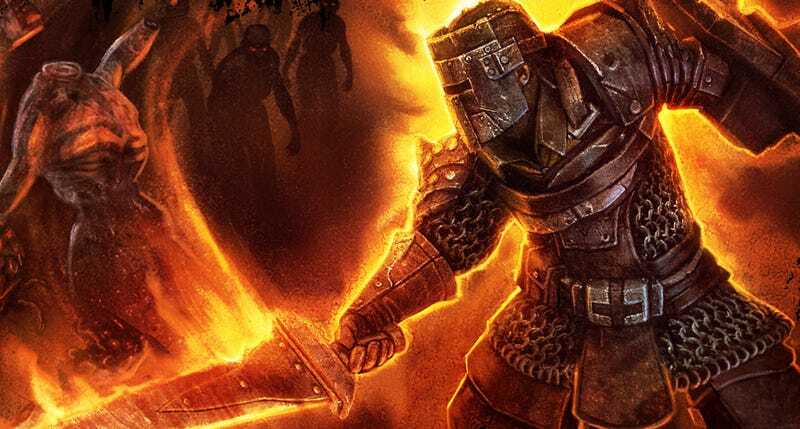 Diablo was one of those rare games John could play with his father, so he backed back the 2012 Kickstarter for Grim Dawn, which raised more than $500,000. Lung cancer is a fucker, which meant Lee was in and out of the hospital. The first time, though, is when he decided to leave the computer on at home. It was a week before Lee made it home, but the game stayed on, and he finished the quest. This was the last time he logged into Grim Dawn; the hospital stays became more frequent. When John would visit the hospital, he’d bring an iPad. Lee didn’t want to check Facebook or see what was on the news. Instead, Lee would log into the Grim Dawn forums to see when the next update was coming and what might change. “He was mad he couldn’t see the ‘new since you were last here’ posts because he wasn’t on his own machine,” said John. When John’s son would visit his grandfather, he’d sit and watch him play. On November 2, at 64-years-old, Lee Hathway passed away. He would have been 65 years-old only eight days later. The next day, John wrote his forum post, thanking the developers for the joy their game had brought his father. John planned to play through the game again with this son—as as soldier, naturally—to pay tribute. Less than an hour later, Grim Dawn designer Kamil Marczewski replied. “This,” as it turned out, was turning Zedlee into a guard within Grim Dawn. Praetorian Zedlee was scheduled for the game’s next update. When Crate manager Arthur Bruno saw the forum post, he was deeply moved. Bruno only wishes he could have given Lee beta access to see the new material Crate was working on. That content was released only weeks after Lee passed. The post made the rounds at Crate, and everyone felt compelled to do...something. Bruno suggested adding Zedlee to the game in some capacity, but one of the designers had already beat him to it, renaming an in-game NPC. The NPC, Praetorian Zedlee, looks like a soldier on purpose. That, too, is a tribute. “My family lost a loved one not long ago, in a similar way,” said Bruno. A few weeks later, the game was updated and Praetorian Zedlee appeared. John sat down with his children—ages 1, 5, and 7—and loaded up Grim Dawn. “It was great but incredibly sad,” he told me. John called up his brother, who also played the game, and the two logged in. A screen shot of Praetorian Zedlee forever guarding the world of Grim Dawn, a member of the Black Legion, is the desktop background on John’s computer. “It will probably stay that way for a long time,” he said. The Hathway family has also opened a Child’s Play charity in honor of Lee.